I have talked about many things on this blog. Best titles for midget Westerns? Check. Tossing my underwear to Eddie Van Halen? Check. But I was surprised to learn that I have never done a Top 10 favorite movie list. I love movies and I love lists, so what the heck happened? I am not sure but thanks to Jay Noel for today's inspiration. Granted some of these films will not be on some people's favorite list but that is what makes us unique and individuals. So what do you think of my list? What are some of your favorite movies? The Big Lebowski - If you have read this blog for at least a year then you know I love this movie. I started a tradition on my birthday a few years ago to watch this movie and that is what I do. I saw it for the first time in college and was not sure what I thought of it. I did not hate it but I did not love it. Well eventually I watched it again and again and again ... well you get the picture. It just makes me happy, man, and so you know the Shife abides. The Shawshank Redemption - Another one I saw initially in college. Are you noticing a trend here? This film blew me away. We decided to go to the movies one night and someone picked Shawshank. Nobody knew anything about it and it just was mesmerizing and engrossing from the beginning. It is one of those films that makes you stop when you are channel surfing when you run across it and start watching. Animal House - I saw this one before I went away to college and it is one of the reasons I wanted to go away to school so I could party like Bluto. Of course it is also quite hilarious. It has been a little bit since I last saw it but it is definitely a movie that stands the test of time. Batman trilogy (Batman Begins, The Dark Knight, The Dark Knight Rises) - It is hard to pick one favorite out of the Christopher Nolan/Christian Bale series so I just included the whole group as a pick. I love the darkness, vulnerability, humor, themes and special effects of this Batman series, and it doesn't hurt that Christian Bale is one of my favorite actors. The Princess Bride - Another movie that resonated with me long after I saw it. I had no idea what I was getting into when I sat down to see it but then it just kept sucking me as I was enjoying the adventure. I look forward to the day that I can sit down and watch it with Kyle and Hayden. Four Feathers - A grand, epic, period-action drama that bombed at the box office but for some reason I fell in love with it. I don't know why it speaks to me but it does, and I like it more every time I watch it. Se7en - A dark, stylish thriller that had me on the edge of my seat from pretty much the beginning. The cinematography, music, plot and acting all working together to create a magnificent masterpiece. Fight Club - Dark and funny. Two things I really love in a movie especially when it is done as well as Fight Club. Sensational, bold and hits you with a nice sucker punch at the end. The acting is phenomenal and it is just a fun cinematic ride. Star Wars - A movie that left a lasting impression on me. I saw it for the first time when I was maybe 8 or 9 and it was absolutely amazing to a young boy like myself. I had never seen anything like it before and it made me look at the stars and life a little differently after watching it. 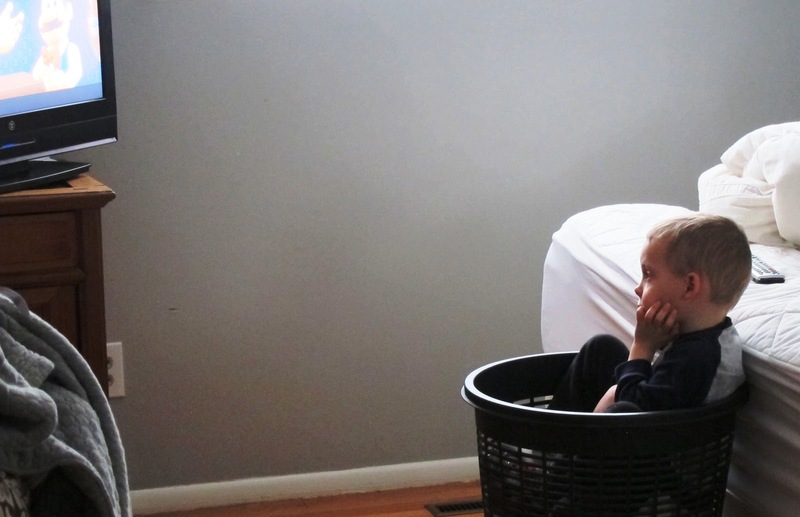 I wonder if Kyle will love movies as much as me, and I also wonder how much longer he will watch his cartoons in my laundry basket? I will persevere. I will keep moving forward. I will be the stream. I'm with you on Casablanca... it's a true classic. Can't say I've heard of the others on your list but the old memory isn't what it was. Heehee what's with the laundry basket? Had to smile at that. Many of your favorites are on my list as well (if I made one)—especially 2, 3, and 6. Kyle will most likely use your laundry basket as a comfy chair until he gets too big for it. Sometimes I miss being that small. 3-4-8 are great in my book. That pic reminds me of my kids riding a laundry basket down the stairs. They knew not to ask permission or the mission would have been scrubbed.